What is Artificial Rice Machine? Artificial Rice Machine is to produce artificial rice, which is a grain product made to resemble rice. The raw materials is usually from broken rice, sometimes with the addition of other cereals, and often fortified with micronutrients, including minerals such as iron and zinc and vitamins, such as vitamin A and vitamin B. 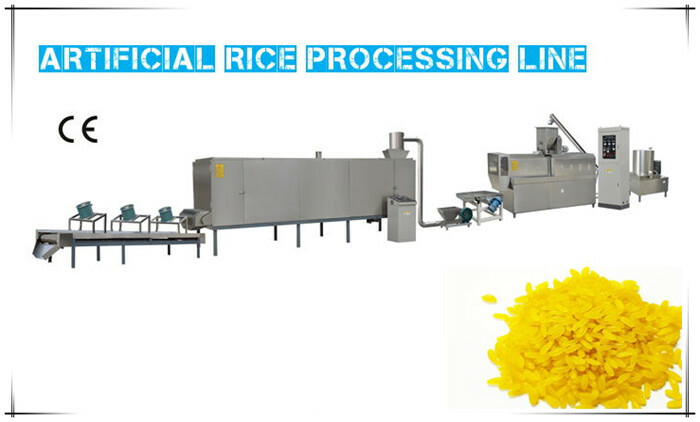 We have developed Artificial Rice Extrusion Line to produce artificial rice, fortified rice and nutrition rice. While adding some support equipment, instant rice can be achieved. The key equipment of Fortified Rice Machine is double screw extruder. We have designed an unique screw to meet the features of rice materials, which can well keep the nutrition of rice, also make good shape and size similar to real rice. After being dried, the artificial rice is suitable to be packed and store for a long time. For more details about Instant Rice Machine, please contact us for more details.